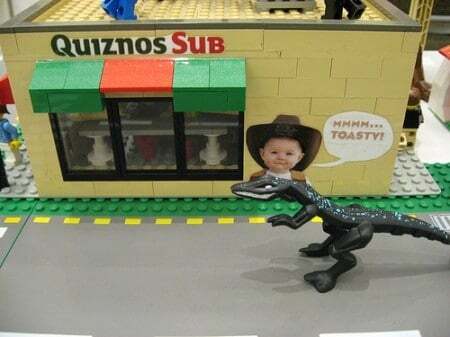 It seems only right that I follow up last week’s post on Subway with one for their arch-nemesis, Quiznos. I’m not as familiar with their offerings, since I found they didn’t have (m)any palatable vegetarian options. I once got a veggie sub that was just hot guacamole and black olives on a huge loaf of bread… what were they thinking? Quiznos’ 17-page Nutrition Information (PDF) is fairly easy to understand (bizarre font choices notwithstanding), and they kindly separate out the cheese & dressing for each sub. They also highlight a handful of menu options that are under 500 calories — if you get the small. I thought Subway’s sodium levels were high until I saw Quiznos’. It’s hard to find any regular sub with less than 1,000mg of sodium — most of them are over 1,500, and some are pushing 3,000! It seems that their bread has much larger serving sizes (judging by the carb totals — they don’t include serving sizes in their nutrition information) and is significantly higher in sodium than Subway’s. Stack on processed, salted deli meat and it’s off the charts. Don’t fall for their marketing hype about Omega-3 oils in some of their sauces – any (minor) potential benefit you’d get from that will be completely overshadowed by the saturated fat and sheer number of calories in the dressings. Unfortunately I couldn’t find any nutritional info for specific components (like the breads or meats), but there are some simple choices that will be at least a little bit healthier. Avoid the ranch dressing, mayonnaise, honey-mustard dressing, and red-wine vinaigrette, as they’re almost entirely fat and salt. Go easy on the cheese, or cut it out altogether. Get the “9 grain artisan wheat” bread instead of the white bread (though the difference may be negligible — it’s impossible to tell from just the name). For the information below, I’m going to use the numbers from the “Regular” size, and assume you’re including the default cheese and dressing, unless noted. These are the only options in this category that I could come up with that are under 1,500mg of sodium (which is still excessive). The standard sandwich does not include cheese. Skip the “Zesty Grille Sauce” and save 70 calories, 270mg sodium, 14g carbs, and 13g sugars. Skip the Ranch dressing to save 140 cal, 2.5g sat fat, 15g total fat, and 250mg sodium. Do yourself a favor and skip the mayo, saving 260 calories (! ), 4.5g sat fat, 29g fat, and 170mg sodium. It seems the only way to get a Signature Club under 1,500mg of sodium and under 600 calories is to get one of the Chicken subs, without cheese or sauce. It also seems like these four subs end up being the same thing — I’m guessing the type of cheese and sauce is what differentiates them. Ahh, well. All of the Signature Clubs are “Worst Choices,” with the exception of the four cheese-less, sauce-less chicken variations mentioned above. Yes, I realize how ridiculous it is to get a “Turkey & Cheddar, Hold the Cheddar.” Even then, these still have nearly 1,700mg of sodium. There must be a typo here — the sandwich alone lists 6g sat fat and 5g total fat. I emailed them. Again with the impossible fat numbers! I emailed them again. I’m using the info for the Small Chopped Salads. For the Regular Salads, you can roughly double these numbers. About two thirds of the calories and fat, and about half the sodium, come from the Peppercorn Caesar dressing. The Ranch Dressing adds most of the fat, calories, and about half the sodium here as well. The Honey Mustard Dressing adds most of the fat & calories, and a third of the sodium. Seeing the pattern here? Yup, the “Creamy Chipotle” dressing is to blame. I’m using the larger “Bowl” size here, and leaving out the crackers. For a cup, just reduce these numbers by half. Two crackers add 45 calories, 1g fat, 140mg sodium, 8g carbs, and 1g protein. Although the Chili has more calories and fat than the Chicken Noodle Soup, it also has lots of fiber and protein — and less sodium. looks like I’ll be getting the Honey Bourbon Chicken, thanks for the tips!